When my daughter Mika asked me if she can have a "little make over" in her bedroom, I rightfully said yes. Why not? She's a darling and she just turned 18 and so, I guess she deserved a fresh start. I could relate to her as I was like that as well when I was about her age. I always wanted to decorate my bedroom even with just simple and inexpensive things. I am the youngest in a family of six but I was never a spoiled brat. I couldn't get what I want in an instant! Having said that, I get easily contented with simple and basic things. I knew that my Mom would not spend a fortune buying me stuff in my room. This is precisely the reason why I want it to be different with my only daughter. If I could afford it and it's not really expensive, I would rather buy things for her especially if I knew that it would serve her well. 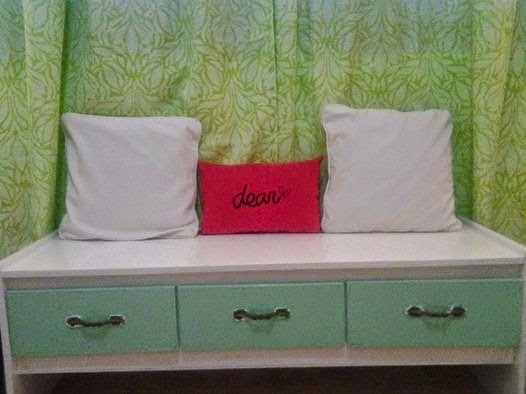 When she showed me the design of the storage bench that she would like for her room, I agreed right away. I find it nice and cute and not only that, it's functional too, so I said, why not? The storage bench comes with 3 drawers and every size is uniform. It's equipped with drawer slides which even made these drawers user friendly. Mika has more rooms now for her stuff. Not only that, she also requested to have shelves over her corner table and the color combination of everything in her room matches accordingly. It's really nice to work on the design for your own room and I would always see my daughter surfing online for more unique designs and decors. I love the fact that she is now deciding for herself and showing a great deal of creativity and love for arts. I love storage benches. It's very space efficient!